Haiti is one of the unluckiest countries on earth. As I write this, a 250 kilometre-an-hour tropical storm is sweeping towards the country, forcing the evacuation of half a million people from the shanty-town camps they’ve been living in since losing their homes and 230,000 countrymen in January’s earthquake, and raising fears that floodwaters could spread the localised cholera epidemic affecting the north of the country to the camps and the capital. And that’s just 2010. 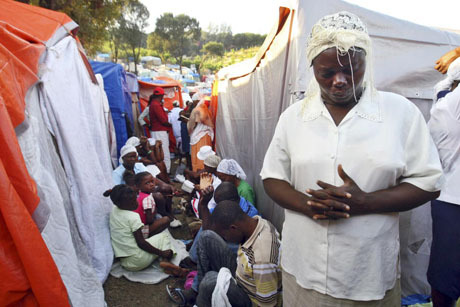 But Haiti’s woes cannot be put down merely to the slings and arrows of misfortune. The earthquake that killed 230,000 Haitians in January had a magnitude of 7.0 on the Richter scale; Christchurch in New Zealand was hit by a tremor measuring 7.1 in September with no fatalities. It is poverty that turns natural disaster into humanitarian catastrophe – and poverty is created. 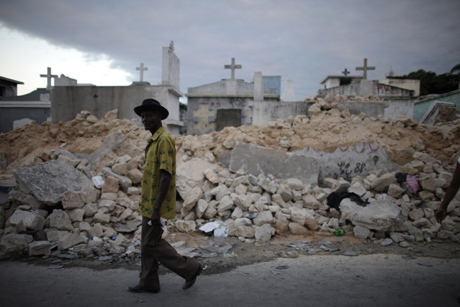 In the aftermath of the Haiti earthquake, many observers became concerned about the potential for a flourishing of one of the phenomena that create poverty: disaster capitalism. As described by Naomi Klein in The Shock Doctrine, disaster capitalism is the exploitation of social vulnerabilities caused by ‘shocks’ such as wars, coups or natural disasters to impose neoliberal policies and projects that would otherwise be resisted. Worried that the earthquake delivered just such an opportunity in a country that is no stranger to either colonial or neo-colonial exploitation, Adam Ramsay and I set up an online group, ‘No Shock Doctrine for Haiti’, to raise the issue with, we thought, a couple of dozen political friends. In a week, 20,000 people had joined. This was no niche concern. The obvious prime suspect was the relief assistance itself. Plenty of donations were flowing into the country, but inevitably there were those who felt yet another loan would help teach Haiti the important lesson of fiscal responsibility. By the time loans could be arranged, though, media outlets had taken up the warnings and the International Monetary Fund was operating under more scrutiny than it is accustomed to. Its response was to cancel all of Haiti’s outstanding IMF debt and issue a new low-interest credit facility to provide reserves and monetary policy levers. The loan came with no conditions and was designed expressly to allow Haiti to spend more freely, not less. In addition, the Post-Catastrophe Debt Relief Fund, created to pay off Haiti’s outstanding debt, has been allowed to continue, and now stands as a pot of cash ready to offer similar relief to other indebted countries facing natural disasters. So we can say with some confidence that some measurable good came out of the international expectation of shock doctrine tactics – and the scrutiny and campaigning that expectation bred. Forewarned was forearmed. But inevitably the TV crews leave and the international gaze moves elsewhere. 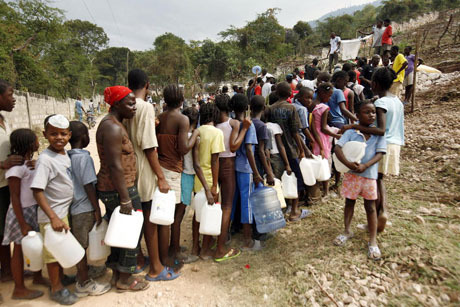 Events in Haiti since it was the focus of our attention have gone rather more as feared. In May, Monsanto delivered a ‘donation’ of 60 tonnes of hybrid seed maize and vegetables to Haiti, promising 340 tons more during 2010. One doesn’t have to be too cynical to become suspicious whenever Monsanto claims altruistic intent. 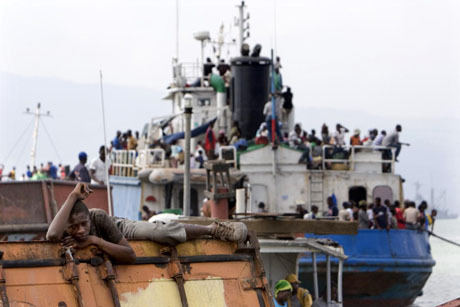 In this case, the biotech giant sought to further the cause of corporate-dependent, export-led agriculture in Haiti, at the expense of indigenous farming techniques and varieties. Hybrid seed rarely produces a viable second generation, unlike Haiti’s native varieties. This means that once a farmer has planted a crop of hybrid, breaking the chain of harvesting and replanting his seed, he will have to carry on buying new seed stock every year. Many of the Monsanto products are also heavily dependent upon artificial inputs such as fertilisers and pesticides, all of which have to be purchased every year. The varieties pushed by Monsanto and the like are few in number. They are designed to be consistent, not diverse. Farmers working without artificial inputs and sophisticated irrigation will normally plant a wide variety of seed – one drought-resistant, one flood-hardy; one that survives fungus, one not favoured by locusts. This means a crop is likely no matter what misfortune befalls the growing season. Monsanto monocultures leave farmers vulnerable. Haitian farming techniques may not be as technologically sophisticated as those of richer countries, but Haitian farmers are not uneducated hicks. There is a developed peasant agronomy supported by local colleges and farmers’ organisations. Locals know that their traditional crop varieties are dying out under the economic onslaught of the heavily-marketed corporate varieties that are demanded by American buyers. They know that this is disastrous in the long term for Haitian farming. But Monsanto was banking on the Haitians being so desperate as a result of the earthquake that they would plant anything. Some rural groups did mobilise in protest at Monsanto’s Trojan horse, burning Monsanto seed in the square of the town of Hinche. The marchers’ declaration proclaimed: ‘We defend peasant agriculture, we defend food sovereignty, we defend the environment of Haiti until our last drop of blood.’ But seed was in short supply, as much of the previous year’s stores had been used to feed victims of the earthquake. So, for the most part, the gift was accepted, whether gratefully or not. The Monsanto donation shows that, in the aftermath of a disaster, quite dramatic private corporate activities can evade the scrutiny attracted by international macroeconomic interventions such as an IMF plan. Indeed, they can even disguise themselves as part of the humanitarian response. And while popular political power might not totally have broken down, it is likely to be undermined by immediate physical need. Effective public opposition has been even more muted in the face of the privatisation of Haiti’s monopoly telecommunications company Téléco. Sixty per cent of the wholly-state-owned firm was sold to Vietnamese company Viettel in a deal that was arranged prior to the earthquake but only completed afterwards. The sale of Téléco illustrates just how cheaply assets are sold when catastrophic conditions leave countries with no ability to act in their own long-term interest, so grave are their short-term needs. Even before the earthquake, Téléco had been losing money. Some of the most pro-privatisation reports put the loss at as much as $1 million per month. In order to remain viable without aggressively reducing staff, which the government was keen to avoid given Haiti’s 50 per cent plus unemployment, Téléco needed a capital injection to expand coverage and increase subscription numbers. If that had been done, Téléco could have made money instead of losing it. So many people were without a fixed-line telephone that Haiti represented one of the few growth markets left in telecommunications. If Téléco could have expanded coverage while in government hands, it could have provided reinvestment capital to develop the country’s information infrastructure. Instead, however, Téléco was sold at a very attractive price to a company bearing promises of rapid fibre-optic expansion – 5,000 kilometres in 12 months was claimed – in exchange for the lion’s share of profits and total control. In infrastructure privatisations elsewhere – for example, water services in Tanzania and South Africa – we have seen that private coverage expansion is a phenomenon restricted to those neighbourhoods whose residents can afford to pay top prices for the service. A fibre-optic network from a private investor – if it succeeds at all – will not be used to deliver information empowerment and economic opportunities to the poor of Haiti but to the rich. In addition, Téléco’s assets included authority over mobile phone bandwidth. While the company was effectively a government agency, it could regulate this in the public interest; indeed Téléco did not run its own mobile network but instead licensed the airwaves much as Britain’s Ofcom does. With its sale, both a very obviously public asset – the airwaves – and a regulatory function of government pass into private hands. In this way, the fruits of economic development are denied to local people and spirited out of the country as dividends, whole functions of government are sold off, never to return to democratic control, and development strategy is reshaped to increase inequality, not constrain it. The case of Haiti shows that though the world is no longer entirely naïve to the shock doctrine, it’s what remains after our attention wanders that causes the lasting hurt. It’s the corn shipment, or the phone privatisation. It’s the aftershocks.